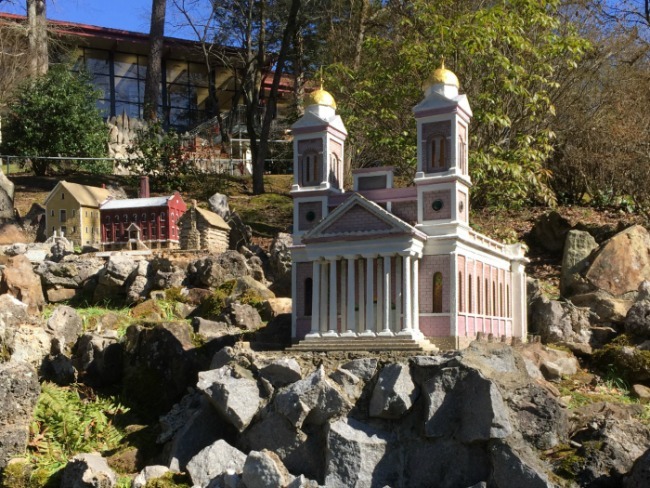 The legacy of architectural model builder Joseph Zoettl draws tourists to the St. Bernard Monastery in Cullman, Alabama. 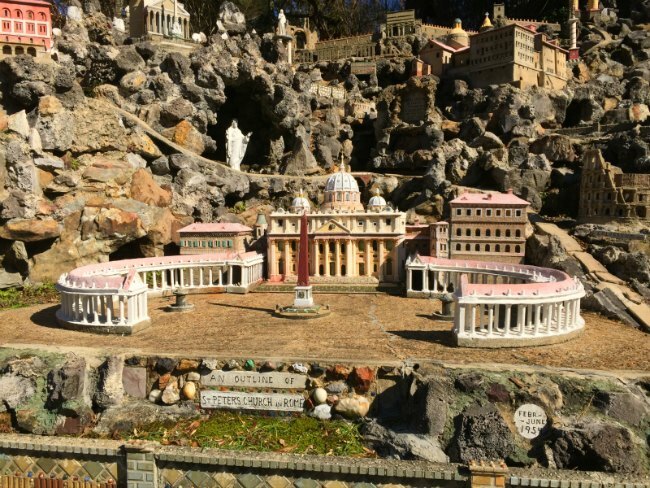 He supported the monastery by running its power plant, but a side hobby, building replicas of famous religious structures, became his lasting contribution to his monastery. 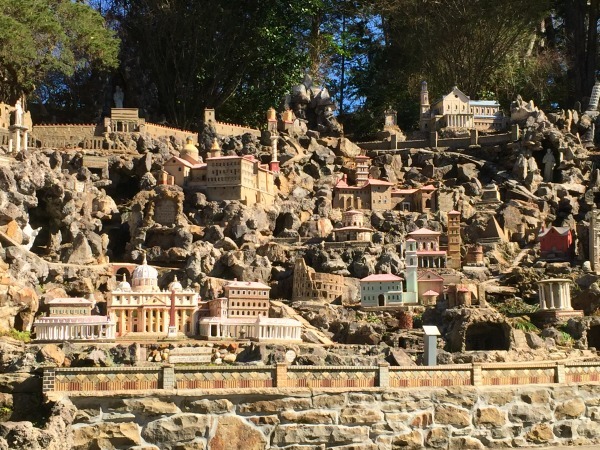 An old quarry provided the backdrop for his collection of miniatures. As word began to leak out about what this gifted monk was doing, he began receiving donations of discarded building materials. Yet it wasn't only your traditional architectural model materials that went into his unique collection. Brother Zoettl used bottles, buttons, shells, and just about anything that struck his artistic eye. I visited there in a hurry. A traffic delay cost me, and I had to make a flight. 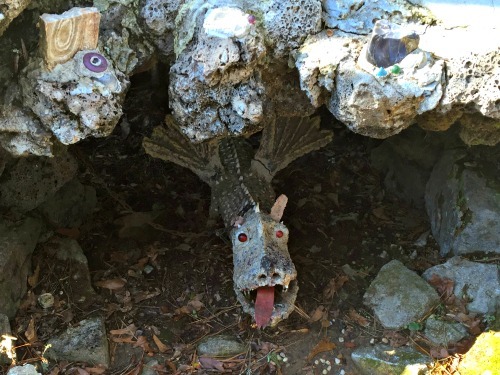 Cullman wasn't far off the highway, so I had just enough time to find the grotto, and snap a few pictures. It is these hurried photos that I am sharing now. 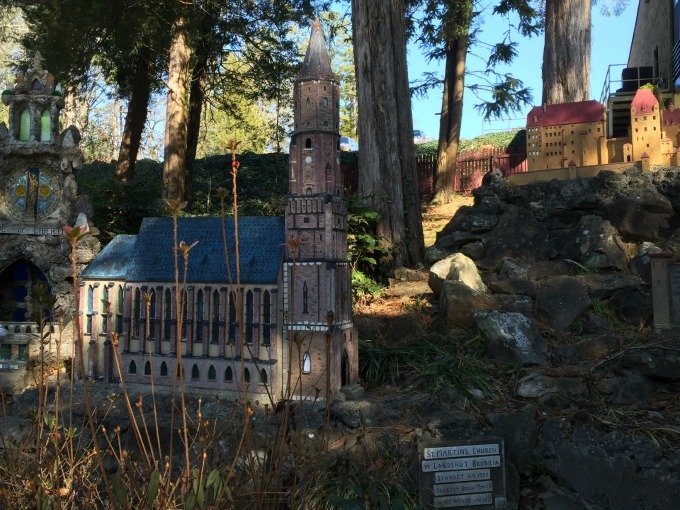 Some models are locally important, like this Cathedral of the Immaculate Conception. The original is in Mobile, Alabama. Consider the scale of the undertaking. This is about 1/10th of the hillside. It is filled with models. St. Martins in Landshut, Bavaria, hometown of the model builder. Many models are clearly identified. The model builder, brother Joseph Zoettl, was born in Landshut, Bavaria. He was recruited by the Benedictines at age 13 to staff their new monastery in Cullman, Alabama. He emigrated at 14 and was soon engaged in helping to construct the monastery buildings. Had life been fair and easy he would have become a priest. It was not. He was seriously injured while working construction. The injury resulted in his having a permanent hunchback, a deformity that disqualified him from the priesthood. In 1911 he was set to the task of running the power plant for the monastery. It involved a lot of hard work, shoveling coal, but also left him with tedious hours. He discovered the writings of St. Theresa of Lisieux. Her "Little Way" captured his imagination and led to his creating miniatures as a physical manifestation of that philosophy. You can see where it led for yourselves. 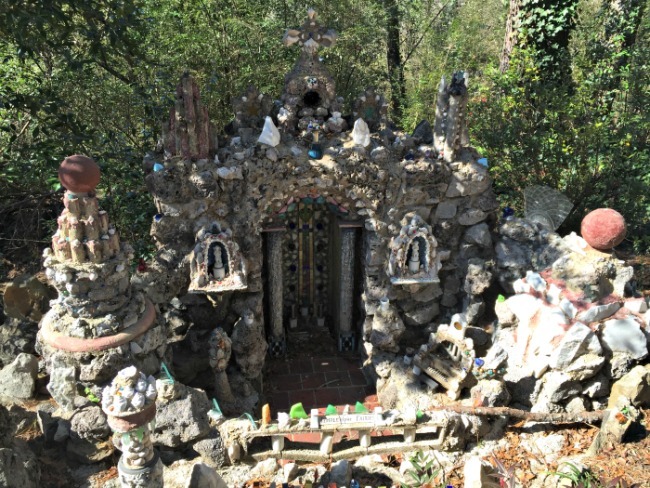 Some of his models were works of fancy, such as this grotto named simply "Temple of the Fairies". If you are looking for historical accuracy you may not find it here, but you may encounter dragons. If you want to learn more about Brother Zoettl there is a documentary available.